We have talked about the specifications of computer audio and the basics of surround sound. Most desktop computer systems do not have built-in means to playback audio and most laptops have very limited speaker capabilities. How the audio moves from a computer system to external speakers can be the difference between clear crisp audio and noise. This is the most common form of interconnect between a computer system and speakers or stereo equipment and are the same 3.5mm connectors used on portable headphones. The reason that these are used so frequently is the size. It is possible to place upwards of six mini-jacks on a single PC card slot cover. In addition to its size, mini-jacks are widely used for audio components. Portable audio has using these for many years making a wide range of headphones, external mini-speakers and amplified speakers compatible with the computer. With a simple cable, it is also possible to convert a mini-jack plug into the standard RCA connectors for home stereo equipment. Mini-jacks lack dynamic range though. Each mini-jack can only carry the signal for two channels or speakers. This means in the 5.1 surround setup, three mini-jack cables are required to carry the signal for the six channels of audio. Most audio solutions can do this without a problem, but sacrifice the audio-in and microphone jacks for output. The RCA connector has been the standard for home stereo interconnects for a very, very long time. Each individual plug carries the signal for a single channel. 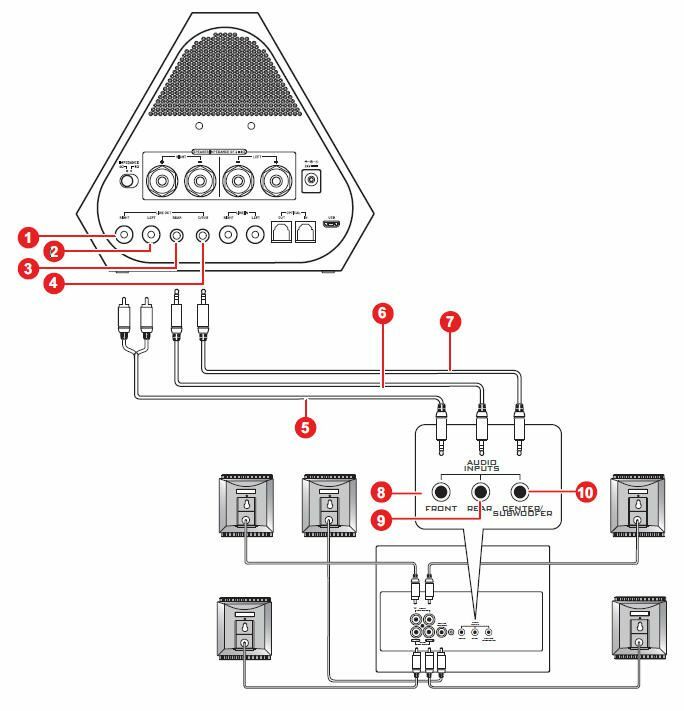 This means a stereo output requires a cable with two RCA connectors. Since they have been in use for so long, there has also been a lot of development in the quality of cabling. Of course, most computer system will not feature RCA connectors. The size of the connector is very large and the limited space of the PC card slot prevents many from being used. Typically, no more than four could reside in a single PC slot. A 5.1 surround sound configuration would require six connectors. Since most computers are not hooked up to home stereo systems, the manufacturers generally opt to use the mini-jack connectors instead. Some high-end cards still do offer a pair of RCA stereo connectors. With the advent of digital media such as CD and DVD, there was a need for preserving the digital signal. Constant conversion between analog and digital signals induces distortions into the sound. As a result, new digital interfaces were created for PCM (Pulse Code Modulation) signals from CD players to the Dolby Digital and DTS connections on the DVD players. Digital coax is one of the two methods for carrying the digital signal. Digital coax looks identical to that of an RCA connector but it has a very different signal carried over it. With the digital signal traveling across the cable, it is able to pack a complete multiple channel surround signal into a single digital stream across the cable that would require six individual analog RCA connectors. This makes digital coax very efficient. Of course, the drawback to using a digital coax connector is that the equipment that the computer hooks into must also be compatible. Typically, it requires either an amplified speaker system with digital decoders built into them or a home theatre receiver with the decoders. Since the digital coax can also carry different encoded streams, the device must be able to auto-detect the type of signal. This can drive up the price of the connecting equipment. As good as digital coax is there are still some inherent problems. Digital coax is still limited to the problems of an electrical signal. They are affected by the materials they travel through and the electrical fields that are surrounded by. To combat these effects, an optical connector or SPDIF (Sony/Philips Digital Interface) was developed. This transmits the digital signal across a fiber optic cable to retain the signal integrity. This interface was eventually standardized into what is referred to as a TOSLINK cable and connector. TOSLINK connectors provide the cleanest form of signal transfer currently available, but there are limitations. First, it requires very specialized fiber optic cables that tend to be more expensive than coax cables. Second, the receiving equipment must also have the ability to receive the TOSLINK connector. This is generally found on the home theater receivers, but it is very uncommon for amplified computer speaker sets. The Universal Serial Bus or USB is a standard form of connection for just about any type of PC peripheral. Among the types of peripherals, audio devices are also used. This can be headphones, headsets and even speakers. It is important to note that devices that use the USB connector for the speakers are also in effect the sound card device as well. Rather than the motherboard or sound card rendering and converting the digital signals to audio, the digital signals are sent to the USB audio device and then decoded there. This has a benefit in fewer connections and the speaker also acting as the digital to analog converter but it has major downsides as well. For one, the sound card features of the speakers may not support the proper decoding levels necessary for higher quality audio such as 24-bit 192KHz audio. As a result, make sure to check what digital audio standards they support just as you would a sound card. What Connectors Should I Use? This is going to be very dependent upon how the computer will be used. In most cases, the only connectors that are required will be the mini-jacks. Any sound solution that you purchase should at least have a headphone or line-out, line-in, and microphone jack. These should also be reconfigurable to allow for the three to be used as outputs for surround sound. For higher quality audio for home theatre environments, it is best to make sure that the audio components on the computer have a digital coax or TOSLINK line out. This will provide the highest sound quality possible.